Residents will soon be receiving a “Save the Date” postcard in the mail with important dates regarding our upcoming September 27, 2016 Capital Project Vote. The public hearing will be September 20, 2016 at 7:00 pm in the HS Library. You can also expect our school calendar, which was beautifully created by District Clerk Kathy Tucker, in the mail as soon as this weekend or next week. An electronic copy of this calendar will also be linked on the district website. Our district newsletter, The Bulletin, will be delivered to residents soon after school begins. The Bulletin includes a four page insert with information on the finalized capital project proposal. I will also post the components of that insert here for residents who prefer to read their news on line. Good communication is important to us. We want to listen as well as we are sharing information. Remember that we are available via email, for a phone conversation or a visit–I can be reached at 592-3230. Hope to see everyone at our many events this fall! At the August 8, 2016 BOE meeting, we were pleased to appoint Mr. Christopher Scarpine as the new SES Principal. Mr. Scarpine has been the Middle School Assistant Principal for the Lake Shore Evans-Brant CSD since April, 2014. Prior to that he was an SES classroom teacher of grades 3, 4, and 5 from 2005-2014. Chris brings a great set of leadership skills to his principalship and we can’t wait for him to get started! We are hopeful that Mr. Scarpine can begin prior to the start of the school year but must also be respectful of the needs of his current district. On August 15, 2016, Ms. Marcole Feuz and Mrs. Kathy Townsend will transition to their new roles as Colden Elementary Principal and Principal for Special Programs. To help facilitate a successful transition for all, Ms. Rochelle Sarikey, Director of Special Education who is located in SES, has offered to lead SES for the weeks in between principals. Thank you Ms. Sarikey! We are delighted to welcome Chris Scarpine back to SGI as the Springville Elementary School Principal! Congratulations Mr. Scarpine. We are excited to bring back the Bulletin, our SGI newsletter! Given this week’s unfortunate closure of our local newspaper, the Springville Journal, it’s fortuitous that we have been planning this for the last few months. Attention all SGI employees: If you have an article of interest to our school community that you would like to see published in our district newsletter, please submit the article and applicable photos to Laurie Pfeffer in our district office. You can email Laurie at lpfeffer@springvillegi.org. We are planning seven issues to be published and mailed during the 2016-17 school year. The deadline for our first issue is August 5, 2016. The Best-Laid Plans. . . often go awry. This saying is adapted from “To a Mouse”, by Robert Burns and it clearly applies to our hiring process as outlined for our SES Principal position. Today is the closing date and I was astonished to receive only a few applications. I thought we’d gotten everything right: identified our process, invited participants on the interview committee, all set to go for 8/8 BOE Approval, communicated the process to our school community here. The best-laid plans, right? And here’s where it goes awry. The Buffalo News did not run our ad. They are now– our SES Principal position will be advertised in print and on their website for the next week at no additional charge to the district. This means we are moving our closing date to next Tuesday, July 26. Round #1 Screening Interviews: Wednesday, July 27, 2016, beginning at 8:00 am. Round #2 with a Committee including a representative from each union and 3-4 SES teachers: Monday, August 1, 2016, beginning at 8:30 am. Round #3 Final Interview with me and a BOE member from the Personnel Committee, Thursday, August 4, 2016, beginning at 8:30 am. This should still afford us the time to have our new SES Principal selected and BOE appointed at our next BOE meeting on August 8, 2016. With the movement of Kathy Townsend to our Principal for Special Programs position and Marcole Feuz to the Colden Elementary Principal position, we have posted and advertised for our K-5 Springville Elementary Principal position. What an incredible opportunity to work with an amazing faculty and staff with wonderful students and families! We are looking for a positive, enthusiastic, caring and dedicated building leader who wants the chance to make a difference in the lives of our children. Application files are due to me in the district office by July 18, 2016. I’m excited to review all of the applications. Our process will include three rounds of interviews. The first round of interviews will be a screening interview in which we will interview as many of the candidates as we find are qualified and fit our criteria. This round is scheduled for Thursday, July 21, 2016 and will be with me, our directors, JoAnn DePue and Shelly Sarikey, and two representatives of our faculty. Successful candidates from round #1 will be invited back to a committee interview in which every union is invited to send a volunteer, SES will have 3-4 teacher representatives, and the PTA will be invited to participate. Round #2 interviews will be scheduled for Wednesday, July 27, 2016. From those round #2 committee interviews we will likely move two finalists on to a final round #3 interview with me and one BOE member from the Personnel Committee on August 1, 2016. We will then be happy to ask for BOE approval of our new SES Principal at our August 8, 2016 BOE meeting. As sometimes happens, one change can lead to another. With our current Colden Elementary Principal, Mrs. Kathy Townsend, accepting a new position within the District an opportunity at Colden Elementary opens. I am delighted to announce that our current Springville Elementary Principal, Ms. Marcole Feuz, has accepted the Colden position! This move is a homecoming of sorts for Ms. Feuz, as she was raised in Colden and currently resides there with her husband. Previously an assistant principal in the SGI District for 3 years, Marcole has been the SES Principal since 2011. I am so proud of the work we have accomplished together at SES! The professional working relationships and relationships with our wonderful families have been incredible for me. We have focused on our students and taken SES “above and beyond” as we intended. I am excited about the opportunity to return to Colden as the elementary principal, to work with what I know is an excellent faculty and staff, and to serve the families of the community I love so much. While the planned changes bring someone new for every building in the district for the 2016-17 school year, I believe that we are at a tipping point as a District right now. We have the right people in the right positions and an administrative team who is committed to working together to make good decisions for the right reasons to move our district forward. Good things are happening Griffins! The Springville-Griffith Institute Central School District is pleased to announce that Mrs. Kathy Townsend was appointed to the new position of principal for special programs at the 7/5/16 BOE meeting. Mrs. Townsend has been the Colden Elementary Principal since July 2011 and has worked as an administrator in the district since 2007. Kathy’s position will be one of new program development and working to support programs throughout the district in collaboration with other administrators. She brings a great deal of experience with a proven track record as someone who can get things done. New program development requires careful analysis, research and planning for successful implementation–these are all strengths of Mrs. Townsend. Development of an in district program for in-school- suspension, out-of-school suspension and an alternative education program. (2016-17 and beyond) I anticipate an in district ISS/OSS program will be in place within the 2016-17 school year while an alternative education program will take more time to develop. Coordination of the K-12 AIS Program (2016-17) including interim formative assessments, grade level data team meetings with building principals, and AIMSweb testing three times annually. Universal Pre-Kindergarten (2017-18 and beyond) Currently only 60 SGI students receive UPK through our collaboration with the Early Bird Learning Center. We are interested in the expansion of this program to serve more of our children. There are multiple funding streams for UPK. We are excited to have a dedicated administrator who can apply for funding, research, plan and implement programs for our children in these critical years of their development and learning. The above are duties and responsibilities, primarily #s 1-3, that require a dedicated administrator to make happen to our fullest advantage as a District. They are needs within the District that we have identified we have not previously focused on sufficiently. I am excited to work with Mrs. Townsend as she makes a significant difference for the children of the SGI school district through this position. Congratulations Mrs. Townsend! At tonight’s Reorganizational BOE meeting, we will be presenting a proposed capital project that has been previewed through a series of posts over the past week. This is the seventh and last in the series. Today we look at a comparative analysis of the new proposed scope of work to the December 2015 proposed scope, including the average cost to the taxpayer. In the December 2015 informational newsletter for a Capital Project Referendum that taxpayers received, readers may recall that the total project was $38,722,000. This included proposed work of $1,772,000 at Colden Elementary, $5,804,000 at Springville Elementary, $8,552,000 at Springville Middle, $21,583,000 at Springville High, and $1,061,000 in the District Office and other buildings. 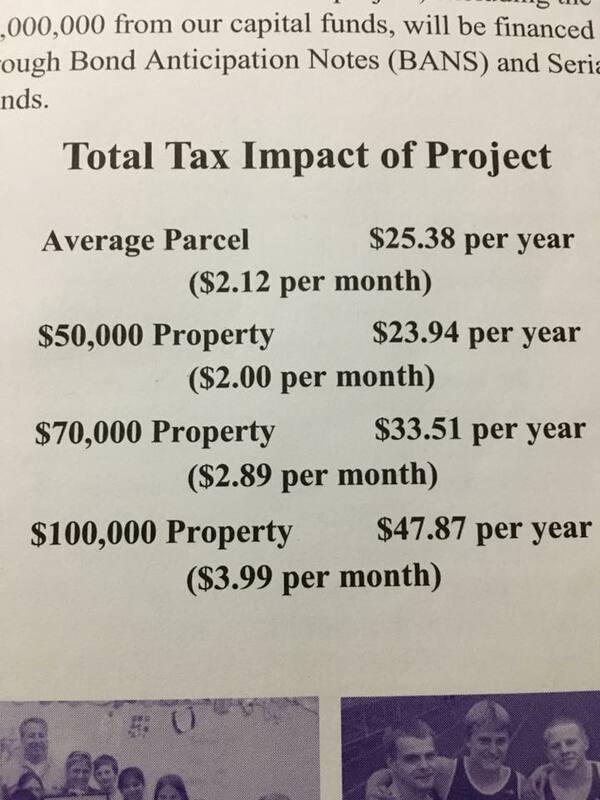 Also shown in the December 2015 Project newsletter was this average cost to the taxpayer. The total proposed scope of work the SGI BOE will review this evening is $26,891,000, plus $1,334,000 planned for capitalized interest bringing the total project to $28,225,000. This includes proposed work of $1,552,000 at Colden Elementary, $6,527,000 at Springville Elementary, $9,517,000 at Springville Middle, $8,631,000 at Springville High, and $664,000 in the District Office and other buildings. The average cost to the taxpayer for this new potential scope of work is significantly lower as you can see in the chart below, prepared for us by our financial advisory firm, Bernard P. Donegan, Inc. We’ve maximized how much of the project is aidable (only about 85% of the work at SHS would have been aidable in the December 2015 Project), we’ve included the capitalized interest in the project and we’ve scaled the project back to the work we need to do to take care of our school buildings and grounds. Capitalized Interest allows School Districts to offset the interest expense during the construction phase of a project to minimize local impact prior to building aid commencing. Since building aid will not flow until the final cost reports are filed with SED the District will have debt service payments due without any revenue sources to offset this expense. By including Capitalized Interest in the authorization the District is able to maintain a level local share throughout the project including years in which building aid is not being received. This is the sixth in a series of posts about the capital project needs of the Springville school district. In this series, I am describing the proposed scope of work in each of our buildings. Today we focus on needs at the District Office, Concession Stand, Greenhouse and Press Box. The District offices do not receive state aid in the way that our school buildings do (79.3%). Therefore, I have removed all but two (2) items from the sixteen (16) items proposed in December 2015. All that remains are the replacement of the roof and installation of heat trace tape to scupper drains, totaling $343,000. There is work required at the Concession Stand and that remains the same as the scope brought before the public in December, totaling $15,000. We are not proposing any work at the Transportation Building, the Field House Building or the Colden Elementary Tractor Garage. Our Pressbox needs to be replaced with a new code compliant Pressbox. And our Green House, which was to be demolished in the December 2015 project and yet provides instructional space for our FFA coursework, will need to have the hot water heating boiler replaced, an installation of a backflow preventor on incoming water service, replacement of older electrical equipment and devices and replacement of exterior doors and windows. The work on the Pressbox totals $176,000 and the Green House totals $130,000. If you’re thinking you could build a home for $176,000, please know that’s exactly what our Facilities Committee said and the plan moving forward will be to work to decrease that number to the extent possible. This post concludes the review of the proposed scope of work in all of our school buildings. Tomorrow I will review the costs to the taxpayer as evaluated by our financial advisors. This is the fifth in a series of posts about the capital project needs of the Springville school district. In this series, I am describing the proposed scope of work in each of our buildings. Today we focus on one of our elementary schools, Springville Elementary School. The most pressing need in our district currently exists at SES and it was not in the December 2015 proposed project. The 1998 portion of our roof at SES is failing. We have brought in the architect, construction management firm, and roofing experts and all have said they have not previously seen a rooftop fail like this one. And of course, it is out of the warranty period. If we do not pass this project, we will have to find a way to pay for the repairs to this roof which total $968,000 from our local budget. That’s not a ploy to get this project passed, it’s simply the reality of a problem that we face. In the meantime, we are taking care of the rooftop with a stop gap measure and hoping for a mild winter in the 2016-17 school year. This proposed scope also includes new items as follows: replace/enlarge unit ventilator louvers at south wing classrooms including abatement to new code requirements ($71,000) and replace piping in the south wing/modify pumps due to new code requirements ($56,000). Replacing pavement, curbing and sidewalks is again urgently needed for this school and is the most significant expense. Removed from the December 2015 proposed project scope is the relocation of the main office area closer to the front entrance to increase security and relocate existing adjacent offices and Nurse’s office ($825,000). If you’ve been following along with this entire series of posts, you can see by now that I’m recommending the removal of all of these office relocations for security purposes. It is my opinion that the moves are hugely expensive, require building new offices when those that we have are adequate, and give us a false sense of security. There is no fail safe security measure—the best security measures we can possibly implement are those that require frequent drills so that everyone in the system knows the best way to behave in an emergency, how to think on their feet and how to follow the protocols put into place by building and district safety plans. Also removed from the scope is the installation of new carbon dioxide detection systems ($25,000)—we did this in house in our buildings—and the replacement of the exterior wall located at the overhang. That work has to be done under an immediate emergency project and I expect the work to be completed soon. The total bond estimate of work to be completed at Springville Elementary is $6,527,000. We will be reviewing the proposed project in detail at our July 5 meeting, for the BOE’s consideration. Please contact me with any questions, concerns or feedback. Thank you.